Types of Incomplete Spinal Cord Injury | Hupy and Abraham, S.C.
Every spinal cord injury is serious and potentially life-changing, but they are not all the same. Find out about several different types of incomplete spinal cord injuries that can occur because of a car accident, talk to your doctor about your diagnosis, and make sure that you understand your legal rights to a fair recovery if you’ve been hurt in a crash. Anterior cord syndrome, also known as anterior spinal artery syndrome, occurs when the blood flow in the artery that runs on the front (anterior) of the spinal cord is interrupted. A traumatic injury, such as that can result from a car accident, can result in this type of spinal cord injury. Most car accident victims who suffer anterior cord syndrome suffer a complete loss of muscle function below the point of the spine where the injury occurred. However, since only the front of the spinal cord was injured, they typically retain some sensation, such as recognizing touch, below the point of injury. There is no cure for anterior spinal cord syndrome, but some improvement may occur. As the name suggests, central cord syndrome occurs when the middle part of the spinal cord is hurt. In a car crash this may occur when the neck is hyperextended during impact, and typically occurs when the neck is hyperextended and the victim had an underlying condition. Paralysis or loss of movement in the arms and hands is more typical than loss of movement in the legs and feet. However, loss of sensation and loss of bladder control may also occur. Medical treatment for central cord syndrome can include extensive hospital stays to prevent further injury, physical therapy, occupational therapy, and surgery. Treatment can be both expensive and time-consuming, and may not result in a full recovery. Posterior cord syndrome is much less common than anterior cord syndrome or central cord syndrome. 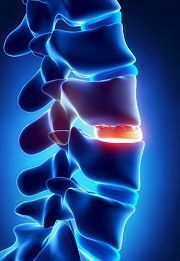 It occurs when the back part of the spine is injured, but the front part of the spine is not injured. The back of the spinal cord is primarily responsible for sensory information. Thus, people who suffer posterior spinal cord syndrome in a car crash may maintain their motor functions and instead have problems with sensory input. Brown-Sequard syndrome occurs when there is damage to either the left side or the right side of the spinal cord, but not to the other side. Paralysis or loss of movement is often experienced only on the side of the body that was injured. The other side of the body maintains motor function, but may experience loss of sensation. Brown-Sequard syndrome is classified as either complete or incomplete, but each type is considered an incomplete spinal cord injury since not all function is lost. Trauma, such as that experienced in a car crash, is one cause of this condition. Brown-Sequard syndrome is also known as BSS, hemisection of the spinal cord, partial spinal sensory syndrome, hemiparaplegic syndrome, and spastic spinal monoplegia syndrome. A severe lumbar spine injury from a car accident can causes compression of the collection of nerve roots located at the base of the spine known as the cauda equina. Immediate surgery is often required when this condition occurs because of a car accident or other cause. If surgery goes well and is done promptly, it may help prevent some of the lasting impacts of cauda equina lesions, such as paralysis of the legs, feet and pelvic organs. Since the surgery must be done quickly to prevent lasting damage to the nerves, it is important to report any lower back pain, pain or weakness in the legs, or other conditions to your doctor immediately. Your medical needs, rehabilitation therapies, assistive devices, and other needs can be expensive, regardless of which of these incomplete spinal cord injuries you suffer. While you are paying for medical care and support, you may be unable to work or unable to earn the same income that you did prior to your injury. You may need help, and if your injury was caused by someone else’s negligent or intentional actions then you may be entitled to a legal recovery. For more information about how to protect your legal recovery after a car crash leaves with an incomplete spinal cord injury, please start a live chat with us today.